Complete your welcome package offered by Casino Big Apple with this delightful reload bonus! 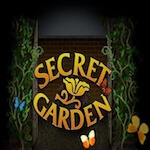 Until 24th of April, all British members have the smashing opportunity of claiming 40 bonus spins on Secret Garden slot. Log into your account and make a third deposit using the bonus code SG40 and the fun can begin! However, keep in mind that this deal has a wagering requirement of 50 times the winnings from the spins. Plus, the maximum cash out is set at £20. Scare the boredom away by claiming this deal from Casino Big Apple!